As part of the White Oak Science Gateway Master Plan, the resource historically known as the Naval Ordnance Laboratory Administration Building (or Building 1) was evaluated for addition to the Locational Atlas and Index of Historic Sites and designation on the Master Plan for Historic Preservation in Montgomery County, Maryland. The Naval Ordnance Laboratory Administration Building is located at 10903 New Hampshire Avenue in Silver Spring, MD (Tax ID 05-280622) within the new consolidated headquarters for the US Food and Drug Administration at the White Oak Research Center. Its resource number is 33/25-1 (formerly 33/14). In July 2013, the Planning Board added the resource to the Locational Atlas as an interim protective measure pending designation. In July 2014, the resource was designated on the Master Plan for Historic Preservation. Once designated, the resource was removed administratively from the Locational Atlas. For designation information about the historic resource and its environmental setting, see pages 80-81 of the July 2014 Approved and Adopted White Oak Science Gateway Master Plan. For further historical information, see the White Oak Science Gateway Master Plan Appendix F.
Architect’s Rendering, early 1940s, possibly by Otto Eggers of Eggers and Higgins. Source: GSA. Constructed in 1946, the Naval Ordnance Laboratory Administration Building was designed by prominent New York architectural firm, Eggers and Higgins (successor to the Office of John Russell Pope), in association with Taylor and Fisher of Baltimore. The Naval Ordnance Laboratory Administration Building served as the headquarters of the Naval Ordnance Laboratory (NOL), a federal facility that played a nationally prominent role in weapons development, testing, and research in the post WWII era. 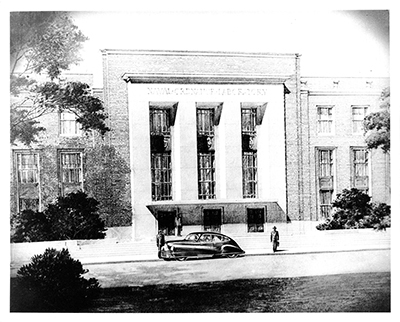 With its planar surfaces, limited ornamentation, and simplified classical composition, the NOL Administration Building is one of Montgomery County’s few and best examples of Modern (or Stripped) Classicism, a style favored for federal buildings in the 1930s and 1940s. NOL spurred the transformation of the White Oak area from rural to suburban. After NOL was decommissioned in 1997, a portion of the site was redeveloped under the project lead of Kling Stubbins, in association with RTKL. Dedicated in 2008, the renovated NOL Administration Building currently houses the Office of the Commissioner and related executive functions for the new consolidated US Food and Drug Administration Headquarters at the White Oak Research Center. In 2010, the building achieved the U.S. Green Building Council’s LEED NC 2.0 Gold certification. Still known as Building 1, the imposing aedifice remains an area landmark, the public face of a nationally important facility, and a reminder of the power of the federal presence to transform a neighborhood.